Many NRI’s and Indians had organized Hawans and special prayer meets for Donald Trump to come out victorious and that he did. However with Trumps ultra-nationalistic policies facilitating the Americans and shunning those from outside, the worst sufferers have been Indians, including those well wishers who had prayed for him then. As per the trends and stats available, the Indian IT professionals have started facing the consequences of US government’s clampdown on work visas. As a consequence to that, major Indian IT firms have stepped up local hiring in the US to meet business demand. Leading IT firms including Infosys, Tata Consultancy Services (TCS) and Wipro have gone on a hiring spree in the US itself. These firms were once known for sending the Indian IT workers to client locations in the US. With the Trump government’s new moves, these companies are now being forced to change their traditional business model. The proportion of sales made in the North American market has also fallen in the year that ended on March. TCS has slipped its market share by 2.4% to 51.6%, Infosys has slipped by 1.5 points to 60.4% while, Wipro has fallen by 1.3 points to 53.4%. In fact, the IT firms had already slowed down sending their domestic workers to the US. The trend accelerated as the Trump government signaled its approach towards work visas. 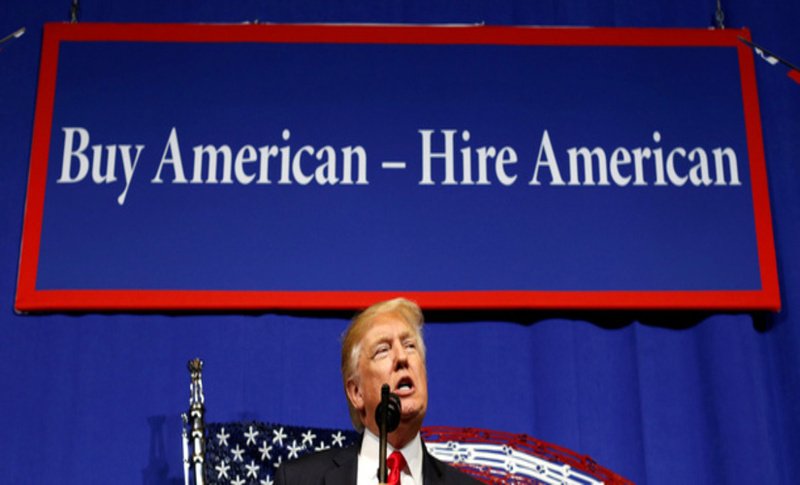 The US government’s toughening requirements for H-1B work visa has made it difficult for the traditional IT business model to survive. TCS, Infosys, and Wipro filed only 40,000 H-1B visa applications in 2017, which is down by nearly 20% in year-on-year basis. Infosys has announced its plan to hire 10,000 new workers in the US. The IT firm will hire 1000 to 2000 new technicians at its advanced research and development hubs in the four US states including Indiana and North Carolina. IT leaders have realized the need of localization of talent. Indian IT industry survives on the traditional IT services in software deployment and related processes such as testing. As these processes are becoming automated, the growth prospects are in question for the leading IT firms. Most of the IT leaders are expanding their verticals in emerging fields such as AI, data analytics, and the internet of things (IoT). President Trump’s ‘Buy American, Hire American’ executive order is working well in the favor of Americans. The jobs that were earlier outsourced to immigrant Indian workers are being allocated to the US citizens. However, the US economy still requires the highly-skilled foreign talent for challenging roles, but the numbers have certainly dwindled. Much therefore, remains to be seen in the years to come as major economic upheavals take place across continents. With many a small factors like this H1-B visa fallout, cumulatively the impact on the Indian Economy can also be felt with much of the lavishness that was prevalent amongst the Indian having subsided in the last 4 years. The the next couple of years are worth a watch.